Macara, the Louise B. McGavock Professor and chair of the Department of Cell and Developmental Biology, is one of about 60 researchers recognized in the first year of this award, which is designed to provide longer-term support for innovative research. “With seven years of uninterrupted funding, NCI is providing investigators the opportunity to fully develop exceptional and ambitious cancer research programs,” said Dinah Singer, Ph.D., director of NCI’s Division of Cancer Biology. If normal epithelial cells lining the internal and external surfaces of the body “suppress the proliferation of their neighbors,” he wrote in the award application, “transformed cells might be unable to express their oncogenic potential unless they escape from (that) environment. “How cells escape the epithelium and proliferate (elsewhere) is central to understanding cancer initiation and metastasis,” he wrote. Macara said the grant will enable his team “to push our research in new directions, to develop new tools and new models that will identify the types of cells from which breast cancers arise, and provide insights into how these cancer cells evade the suppressive influence of the normal tissue in which they are originally embedded. “The seven-year period of the grant is particularly valuable, as it will enable us to try riskier approaches that can take a long time to develop,” he added. Macara said he is “profoundly grateful” to Jennifer Pietenpol, Ph.D., director of the Vanderbilt-Ingram Cancer Center, for persuading him to apply for the grant. “Without her enthusiastic support, I would never have submitted the application. 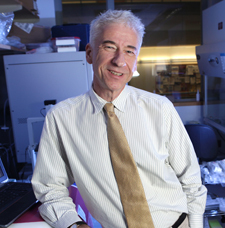 Macara, a senior editor of the Journal of Cell Biology and Council member of the American Society for Cell Biology, has authored more than 160 research publications. Last month he was awarded the 2015 Colin Thomson Memorial Medal by Worldwide Cancer Research for his contributions to cancer research.